The skin is the largest organ of the human body, consisting of over three million cells. It is an active organ and is responsible for all kinds of bodily processes including temperature regulation, the manufacture of vitamin D, as well as protecting the body from external invasion. The skin is divided into three main layers…The subcutaneous or bottom layer contains muscles and fatty tissue that help keep the skin toned and firm. 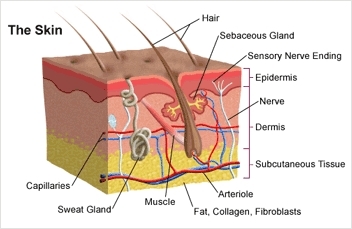 The dermis or middle layer contains sensory nerve endings, blood and lymph vessels, hair follicles and the sebaceous and sweat glands. This is also where new living cells are manufactured before emerging on the surface. The epidermis, or top layer, is the visible surface of the skin, which is composed of flat, essentially dead skin cells. The more rapidly the dead surface cells are replaced by new ones from beneath, the softer and smoother the skin looks. A mass of lifeless cells clinging to the surface of the skin creates a dull-looking complexion Since the natural process of renewal slows down as we age, rejuvenating aroma therapeutic skin products are largely aimed at stimulating rapid cell regeneration in the dermal layer, thus protecting the health of the skin from within. The Ancient Egyptians were renowned for their expertise in this field, successfully using aromatic essences and herbs for their preservative qualities. Recent research has proven that certain essential oils such as Rose, Neroli, Lavender and Frankincense can indeed stimulate cellular granulation, which is the first stage of healing after an injury, and keep the skin looking youthful. Resource: “Aromatherapy: A practical Approach to the Use of Essential Oils for Health and Well-being” by Julia Lawless. At Soy of Life, our premium line of Soy Products includes Soy Shea Butter, Rejuvinating Soy Facial Cream, and Natural Soy Lip Balm.